Permits aren’t necessary on any section of the Smith River. Be mindful that you are in Jedediah Smith State Park and make sure to follow park rules. You can do an overnight trip on the North Fork of the Smith. All the other runs are typically one or half-day endeavors. 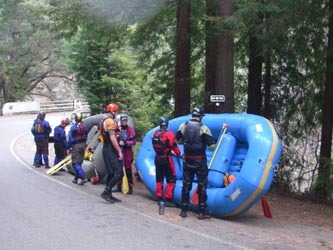 The semi-roadside runs on the Middle Fork of the Smith and the Main Smith River have easy shuttles. The North Fork is a bit more of a drive, and sometimes you will encounter deep mud and snow. Most groups find that having a 4×4 with clearance is extremely useful in getting to the North Fork put-in. Bearfoot Brad Camden offers river shuttles for $40 on the North Fork as well. He can be contacted at (707) 457-3365. The Smith River is located along Highway 199, one of the northernmost highways in CA. To get to 199, you can either head up 101 or 1 along the California coast, or drive north on I-5 into Oregon. In Medford, OR you’ll take 199 west and drive about 70 miles. You can also cut over in Redding and drive through Weaverville, but make sure to check that the roads are open (they often close in the winter). North Fork Put-in: Bridge over NF on Low Divide Road.From 199, head north on North Bank Road. Take a right onto Low Divide Road. You will cross several “intersections” with dirt roads and county roads. Keep staying straight. The bridge is about 25 miles from Highway 199, so don’t get discouraged as you feel like you’re driving into oblivion. Also, this is the road you might want to consider having a 4×4. North Fork Take-out:Middle Fork Confluence Bridge @ Gasquet. From 199, drive east on Gasquet Flat Road about 1/4 mile. There is a bridge over the NF Smith. You can also take out in Gasquet on the Middle Fork. You most likely won’t want to combine this trip with the MF because it will be too long. Middle Fork Put-in: MF Bridge in Gasquet. Same as the NF take-out. Middle Fork Take-out: Above Oregon Hole Gorge. Or you can run another 2 miles of Class IV-V rapids in Oregon Hole Gorge. The take out is about 5 miles downstream of the put-in. It’s not really obvious from the road, but you want to take-out before Oregon Hole Gorge if you’re not a Class IV-V boater. Oregon Hole Gorge Put-in: Along 199, about 5 miles west of Gasquet. You can put-in anywhere above the Gorge. Oregon Hole Gorge Take-out: SF Bridge. Take-out at the South Fork Bridge at the confluence. The take-out is below the bridge on the right. South Fork Smith Take-out: South Fork Bridge. Turn onto the South Fork Road from 199 and head upstream along the river. You will cross both the Middle Fork and the South Fork, and then park in a turnout across the bridge. If you want to avoid running the South Fork Gorge (Class IV-V), you can take out a mile before the South Fork Bridge. South Fork Smith Put-in: Upper Bridge.Keep driving upstream along the South Fork Road. There are several places you can put-in to run the SF, but the furthest upstream bridge is about 12 miles from Highway 199 (10 miles past the 1st South Fork Bridge). You will cross the river two times before you get to the final bridge.